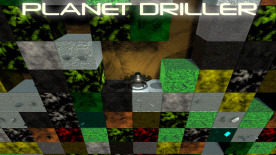 Planet Driller is an addictive mining game with rocking user reviews where you need to find dark matter in order to save the earth. To do this, drill your way through a procedurally generated planet full of minerals that you can sell for cash, then use the cash to upgrade your ship and make the job a lot easier! Planet Earth needs the recently discovered dark matter only found in another galaxy. You are sent to drill a distant planet's surface to find dark matter and save the world!